Is it a fourrée? How can you tell? By definition, a fourrée is made from a base metal core covered with silver foil and struck to look as if it were solid silver. Some pieces are easy to identify as fourrées, but many pieces with some characteristics of fourrées are not actually fourrées. surface patches of surface-silver are clear and patches of coppery metal are clear below breaks in the silvering and the edge of the break shows a firm line of distinction, as if the base flan had been wrapped in foil and the foil had broken. surface patches of silver are clear and it has patches of darker metal, or pits with darker metal, or design chipped off with darker metal below. There is a metallurgical reason that official "silver" issues can have both good silver on the surface and baser metal inside. During the Republic and early empire when denarii were more than 90% silver, this does not happen. But, under the Severans when "silver" coins were only about 50% silver or less, the striking process squeezes the malleable silver to the surface (especially if the flan has been pickled in an acid bath first) and leaves the interior relatively base. An article by Lawrence Cope, "Surface-silvered ancient coins" in Methods of Chemical and Metallurgial Investigation of Ancient Coinage (Ed. Hall and Metcalf, 1972) states "Electron probe micro analysis .. [reveals that] 'platings' of this era are not applied but they stem from the coinage alloys themselves" (p. 266). [The article has numerous illuminating diagrams of alloys and several plates of microphotographs of coins. It discusses the entire range of surface-silvering processes.] He notes that copper alloys up to 85% copper will produce a satisfactory surface-silver layer by the normal process of minting (p. 269). You have probably noticed that the surface silver of a Septimius Severus or a Philip can look great, even though the metal is far from pure. 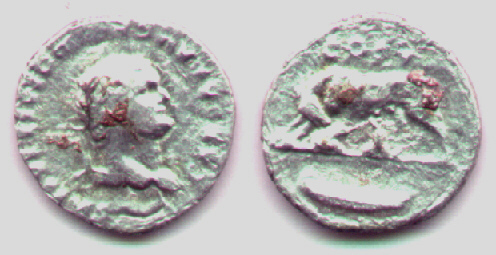 Even the early issues of Gallienus (with silver content down below 20%) can look like silver without an applied surface silvering. The high purity on the surface is balanced by low silver content in the interior. But, there will be no firm line of demarkation. Keep in mind that fourrées were made with silver foil and the line between the silver and the copper is distinct. 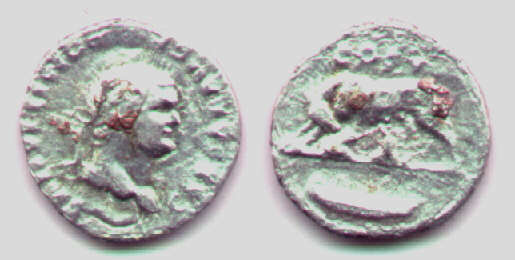 Therefore, a good silver surface and a baser interior is not a sure sign that the coin is an ancient imitation. Images link to larger imges, but not to further text. 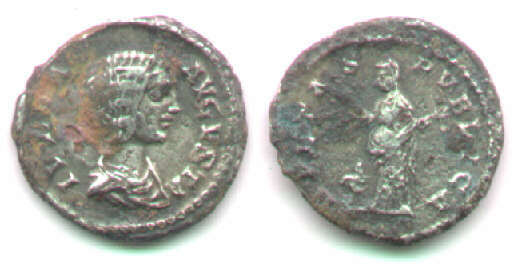 Sear 2241, RIC 224 "scarce, AD 228-231", BMC 522, plate 18, mint of Rome, issue 9, AD 229. This piece shows no surface silver, and even the pits show only dark metal. 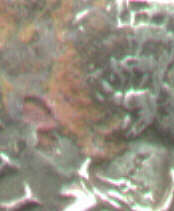 Examination of the surface under a microscope does not reveal obvious silver. So, one might conclude it is some sort of base metal imitation. However, the style seems official. Turning to the edge, microscopic examination under 20x shows a shiny silver color (not obvious in the scan) from edge to edge, with no differentiation through the thickness of the coin. I conclude it is an official issue of the usual debased silver of the period, with corrosion erroneously suggesting a baser metal. 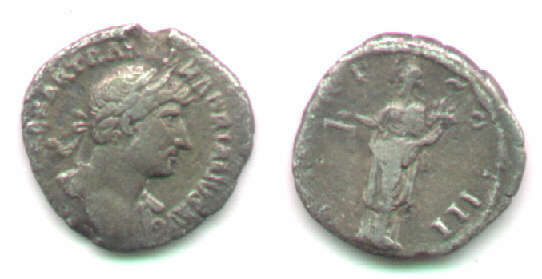 Hadrian, AD 117-138, denarius with metal missing at 12:00 on the obverse. RIC 80, AD 119-122, Sear --. The missing metal at 12:00 looks corroded off (as opposed to fractured off) and the deeper metal is baser and has hints of coppery color. But the coin does not show the distinct edge of a silver of a silver-wrapped copper flan. It is not a fourrée. Sear 1847, BMC (S&C) 70, plate 28.15, page 166 "AD 196-211." The surface shows obvious copper and the pits show copper beneath the silver. However, the style is very good. Microscopic examination shows a highly grannular interior (I wish I had a way to make a micro scan), and even a change from surface-silver to a redder core. But I think this is just the natural result of striking an alloy of only 50% silver or less, as Cope discussed (above). When silver plating breaks, the break is usually much less subtle than this. Domitian, denarius, AR18, 6:00. 2.29 grams. The copper is clear, but is it fourrée? Close inspection under a microscope shows the copper is on the surface -- actually above the surface, not below the surface. The piece was harshly cleaned and it came out shiny, but the cleaning did not remove all the adhesions. I am not a metallurgist, but I think the copper leached out of the coin (it probably had 10% copper in the alloy). My guess is this is an official issue. The light weight is often a sign of an unofficial issue, but here I think it means that much of the metal in the interior has corroded -- even corroded away. Sear 2621, RIC (Vespasian) 241, AD 77-78. BMC (Vespasian) 240-1, plate 7.8, 7.9. Crawford 336/1c, with L/fly as attested on page 337. This piece is in excellent style, with the reverse a tiny bit crude, but hardly more so than many Republican reverses. Only the very clear breaks in the silver show the base core of a fourrée. Examination at 20x shows there is a foil-like surface that has broken on these high spots. It is a fourrée. Here the silver-foil is clearly differentiated from the copper interior which breaks through at the edge and in other places. The silver is clearly on the copper, not the copper on the silver (as sometimes happens due to expansive corrosion of the copper component of the interior of a official silver coin). Also, the style is not official, which is a strong indicator it is an imitation. This one is clearly a fourrée. 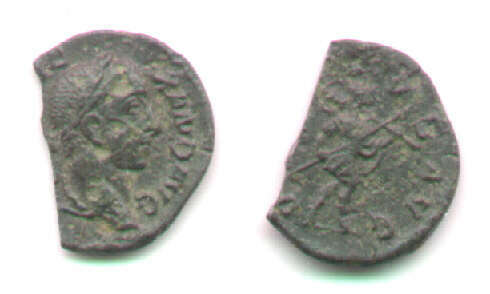 Philip II as Caesar (AD 244-247) 21 mm. 12:00. 3.77 grams. This one is a real puzzle! The style is perfect and the coin is struck and sharp. I would call it certainly official except for one obvious thing -- there appear to be regions of copper below a thin (but not extremely thin) surface layer of silver. The surface-silver seems to be in a distinct layer, and the metal below is without visible silver -- so it is a fourrée (isn't it?). But, how did a fourrée turn out to have such perfect style? Can we decide that official mint workers made it? Or, is the silver in this time period of such low fineness that the separation of surface-silver known to occur when coins are struck produced this extreme example? I have held this one for almost a year before putting it up on this site becaue I just don't know what to think. Return to the main page on imitations.